These nut balls are delicious. And prime for immature joke-making. An FBG fave! You know we can’t handle balls or nuts (there’s a dirty joke there, in and of itself, no?) without making an immature joke, so Betty Lou’s Nut Butter Balls? Someone help us. Or don’t. The comedic possibilities are just too great. Let’s count them shall we? Certified gluten-free, these fiber-rich snacks come in five varieties of yummy and nutty varieties to put in your mouth (1). There’s Peanut Butter, Coconut Macadamia, Almond Butter, Cashew Pecan and Spirulina Ginseng. Three of them are vegan (Almond Butter, Cashew Pecan and Spirulina Ginseng), and the Peanut Butter has 15 grams of protein (the rest have about 10 grams). All of them are free of trans-fats, corn, soy or genetically modified ingredients, so, they’re truly nut balls you can feel good about stuffing (2)…in your purse. The nut balls are a good post-workout snack, with about 150 to 190 calories each and about 5 grams of fiber, and they’re dense and filling (3? Sure.). While all of the flavors were good, Spirulina Ginseng tasted the most natural to me (not a bad thing, just a little extra green) and Peanut Butter was the most mainstream (and I liked its nutritionals most because of the added protein). However, the Coconut Macadamia was my favorite flavor. And I would know; I’ve had a lot of balls in my day (4)…because they sent a TON of these to FBG HQ, of course. I’m obsessed with coconut lately, and Coconut Macadamia was just the perfect mix of the two. Sweet, but not too sweet, nice and coconut-y and a touch tropical. Like a little bite of vacation tucked (5) in your gym bag, these nut balls are. And really, you can’t go wrong with Almond Butter or Cashew Pecan either. They’re all good. 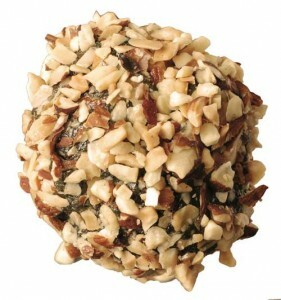 Just like fit bottoms, nut balls come in all shapes and sizes (6). those nut butter balls are just looking to good. the best balls I’ve ever seen. I think I might have to share them on my blog, even though ball sharing is sometimes frowned upon. Awesome, Jennifer. Just awesome. And how are you feeling?! Really interesting nut balls.I’d like to taste them,look so delicious.